Board and batten siding on north wing of house. Obligatory greeting because today is the fourth Thursday of November and I live in the USA. So, full disclosure, I am not a huge Thanksgiving fan. From a culinary standpoint the holiday, manifested primarily through the Thanksgiving meal, is less than desirable in my eye. Too many brown items on my plate. This is regardless of who prepares the meal. Chef Ramsay could prepare dinner next year in our over priced kitchen and it probably wouldn’t be my favorite (bonus points to you for realizing I picked a Brit as my chef example, irony or poor pop references are my middle name). In my case, this year was better than most as we kicked back at my brother’s place and partook in the deep-fried turkey he made for the family. But generally speaking, brown food doesn’t cut it for me. Other pain points of the day include liberals protesting revisionist history and the fact that I’m usually hung over on Thursday (and Friday) morning. And no, I will not be in front of Best Buy in my tent tonight waiting for Black Friday sales. Before I get to the touchy, feely stuff, let’s talk house. I had the opportunity to check out the job site on Wednesday before it got dark. The yard looked a lot different as it was torn up and pipes are running every which way. Our 10,000 gallon cistern is in and pretty much all of the water collection pipes are installed. There were two sections of roof we’re not collecting from so those downspouts run on a separate line. Everything outputs to one of the pools collecting on either side of the driveway. It’s exciting to see all of the infrastructure going in. When complete we will have the equivalent of a water collection and treatment plant on site; a small-scale version of what larger civilization centers use throughout the world. Water is managed on site from the second it lands to the time it exits the property. Every drop of water we use essentially is “rented” by us and the output back into the yard where it is purified again and sent packing back into the environment. Pretty cool and completely self sustaining. We’ll use nature as our model (google “Biomimicry” to learn more) to collect, process and dispose of water on site. We’ll be creating natural habitats that will support a variety of native plants and animals. 10,000 gallon cistern. Lid and two scrubbers will be visible above ground. We'll have to get creative with the landscaping so you can't see them very well when you come to visit. Siding is coming along faster now that they are on the ground. The attic still needs its siding but for now they’re back on the ground. We went with 12″ miratec boards for the “boards” and 4″ miratec ripped down to 2″ for the battens. All the joints are sealed with caulk to keep moisture out of the ends. The trim boards throughout are miratec too. I consider the miratec to be a synthetic wood based material. It has a smooth side and faux wood grain side. We went smoot side out for the trim. It will paint up real nice and give us a clean modern look. Septic tank is back filled. We'll be able to see the tops, but once again, some creative landscaping can obscure these items. Tomorrow Christine and I will work on caulking all of the electrical outlets and penetrations. The following day will be our preliminary blower test. We’ll have the pleasure in the coming days of giving Corky, Barb and another friend tours of the property. Will be the first time they’ve seen it since Corky helped clear the house site and they blessed the land back in June / July. Our other guest has an acute interest in practical sustainability and energy efficiency; so I’m sure he’ll be delighted to learn more about what we’re trying to achieve and how we’re achieving it. I love showing off the property and sharing all the great things we’re trying to accomplish, it’s a great learning opportunity, so no arm bending required on my part to show off the joint. A PVC pipe network underground collects ALL the water off of the hard roof surfaces and manages the water in a controlled manner. About 85% of the water collected will be the house's sole water supply. So that’s about it for the house today. As expected everyone had the day off, though I think even Shane was out there working on the cistern lines this morning. We’ve been fortunate with many of the people pouring their time and effort into our project (yes, I get that I’m paying them, but c’mon it’s Thanksgiving and the dude was probably out there gluing pipe and slopping mud around; more than any of you will get out of me on any given holiday). Detail of downspout routing for use as water supply or diversion to natural pools near driveway. get to the nuts and bolts of your brief existence there’s no better time than whilst chipping frost from your windshield, raking dead leaves in the yard or digging through turkey left overs. I’m thankful for everything that makes up the thirty-eight orbits around the sun that I’ve had on this blue marble. This includes the good, the bad and the ugly. The mosaic that is my life is not necessarily extraordinary; at least to the average person. But what is extraordinary is that it is my mosaic. I could never type an all-inclusive list of what I’m thankful for. I’ve been extremely fortunate in my lifetime; more so than any one man deserves I suspect. I’m grateful for the experiences I’ve had. More so I’m thankful for the people I’ve had in my life. Some I’ve known my whole life. Others I’ve known for what seemed to be a blink of the eye. Some I had the pleasure of spending this special day with; others that I could only spend time with in my heart today. Still others that will forever be available only in memories. I’m thankful for those that brought me into, have nurtured me in and that I’ve brought into this world. I’m thankful for what they’ve done, and not done, for me. Blue foam is done!!!! The entire house is encased in 4″ rigid insulation. We ran out so we had to use 2″ new foam doubled up in the screen porch area. Instead of saying “Happy Thanksgiving”, I should be saying “thanks” to everyone. I’ll plan on trying that a lot more next year on Thanksgiving day; and the other 364. Board and batten siding. Overhang of foam and siding onto foundation is a bit much. Will ruin the look we're going for on the foundation when we go to install stone. We'll fix it down the road though. Need to get siding done without delay. 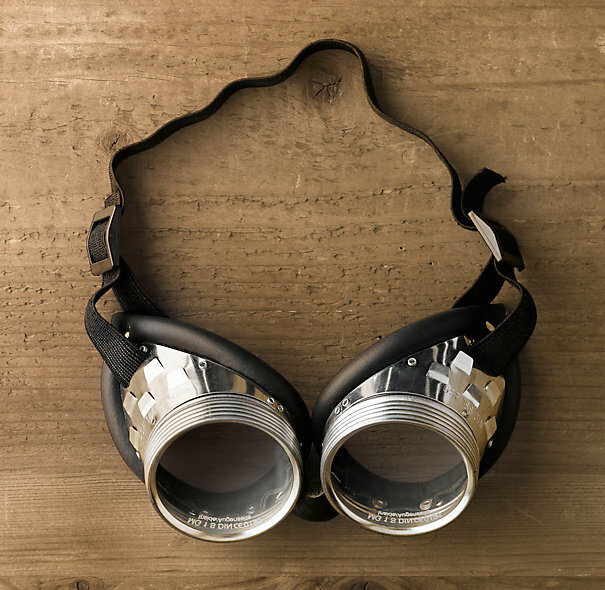 Cool goggles I'm ordering from Restoration Hardware. What? I had a free $100 to spend. I will rock these come snow shovelling season. This entry was posted in Construction, Sustainable Features, Water Supply and tagged building process, cistern, home, septic system, siding, sustainability by Chris. Bookmark the permalink.